You are at:Home»December»December 5»No One Escapes the Bermuda Triangle, not Even the U.S. Navy? On December 5, 1945, a flight of U.S. Navy TBM Avenger torpedo flew into history, providing grist for the paranormal mill that the Bermuda Triangle became! The training flight of Avengers took off from Naval Air Station (NAS) Ft. Lauderdale at around 1410 hours (military time) for a routine navigation training flight. Oddly, although necessary for over water navigation (remember, maps would not help!) each airplane was missing its clock. Assuming the pilots had wrist watches, the flight took off as normal. Things seemed to be going as planned, with a practice bomb drop about 64 miles east of the air station, with routine radio traffic heard. Then, at about 1540 hours the first sign of trouble appeared, when one of the Avengers radioed that he was lost and both of the plane’s compasses were broken. During the next 2 and a half hours a series of transmissions were made back and forth with the flight with the NAS recommending various courses for the planes to take and the pilots reporting that they were still lost. After 1904 hours, no further contact with the flight was made. That last radio transmission was the chilling instructions from the flight leader to the flight that they should keep close together and they would ditch their planes when the first plane’s fuel dipped to only 10 gallons. During this saga, the weather had steadily worsened, making a water landing a shaky proposition. Meanwhile, a PBY Catalina Navy patrol plane and 2 PBM Mariner patrol planes were sent searching for the lost flight in an effort to lead them back to the air station or at least spot where they ditched. 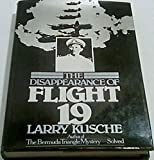 Not only did they never see any sign of the lost flight, but on top of it one of the PBM’s disappeared with no word of trouble and no wreckage found, compounding the mystery and forever furthering the legend. Not only had 5 torpedo bombers and 1 patrol plane disappeared, but also never found were the 14 airmen that manned the bombers and the 13 men on the patrol plane. The Navy’s investigation of the incidents found (inconclusively) that the probable cause of the Avengers’ loss was due to getting lost because of the broken compasses. The investigation also found that the probable cause of the PBM’s loss was due to an explosion on board which would account for no radio transmission of trouble. In the area where the PBM should have been was seen a fiery explosion of unknown origin that the Navy concluded had been the PBM blowing up. Certainly, nobody today knows exactly what happened, but that sure did not stop the rumor mill from spewing fantastic tales of “radio transmissions” about space ships and stories of alien abduction. No such transmissions were made, but that never stopped conspiracy theorists! In the movie, Close Encounters of the third Kind (1974), the crews of the missing flight are shown being returned to earth by an alien space ship. Numerous other cultural references and allusions are made to this incident and it has become a standard of the Bermuda Triangle myth.